The most expensive college in the U.S. is a tiny school that you may have never heard of. Harvey Mudd, a private liberal arts college outside Los Angeles, charged $67,155 for tuition, room and board this year. That's $23,200 more than the average private college. The campus itself isn't particularly extravagant. A lot of classes meet in the basement, there's no rock climbing wall and the school has to partner with two others to field a football team. But it has other perks. Grads are known to land high-paying jobs as soon as they have their diploma in hand. Here's why the school offers a lot of bang for the buck. It costs more to get a degree from Harvey Mudd than it does to buy a home. But this diploma can have a big payoff. 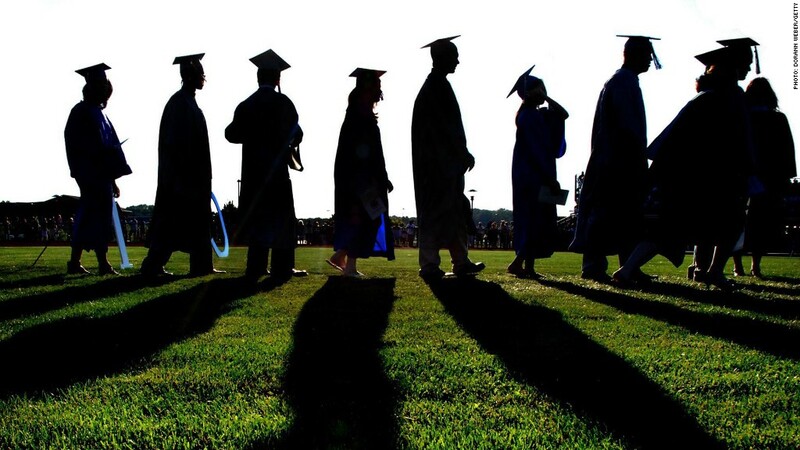 Google (GOOGL) hired 11 of the school's 170 graduates last May. Amazon (AMZN) and Microsoft (MSFT) each hired four. Those aren't outliers. Many students are hired by tech giants as engineers. The median starting salary for the class of 2015 was $92,500 -- double what a typical 20-something with a bachelor's degree can expect to earn. Grads from Harvey Mudd College, a small liberal arts school outside L.A., earn a starting salary of $92,500. Like other private colleges, Harvey Mudd offers students generous scholarships that heavily discount the "sticker price." More than three-quarters of incoming freshmen received financial help from the school this year. And the scholarships could really be a game-changer. The average amount was $26,700. While the school awards some merit-based scholarships, more students are getting an award based on their financial need. Still, about 42% of first-year students took out loans to cover the cost. The average loan size was $5,800. STEM is king at Harvey Mudd. There are just nine majors, each from either the science, technology, engineering or math departments. Every student has to take intro-level courses in each subject, regardless of which they pick as a major. "It's kind of like a four-year STEM summer camp where you work really hard and pull all-nighters, but there is all kinds of exciting stuff happening on a daily basis," said Ian Fisher, an education consultant at College Coach who works with many families on the West coast to find the best fit for their son or daughter. 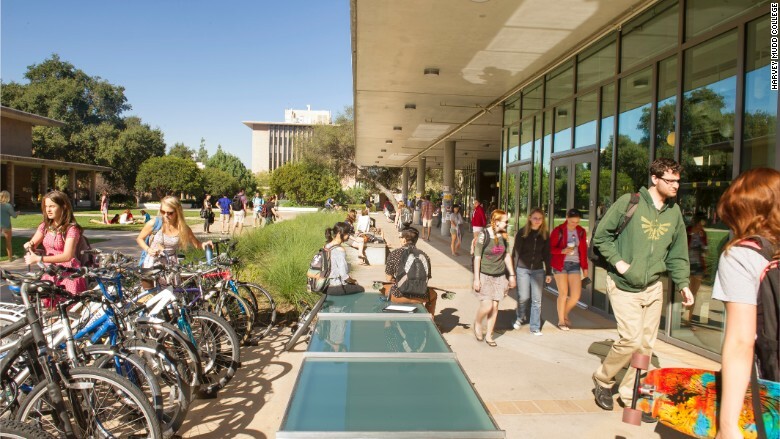 Maria Klawe, the school's president, says that Harvey Mudd's classes are rigorous and move quickly, so students are encouraged to work together. "We move through more material here during the first few weeks of a math class than you would during the whole semester at Princeton," Klawe said. Mudders choose from one of nine STEM majors. 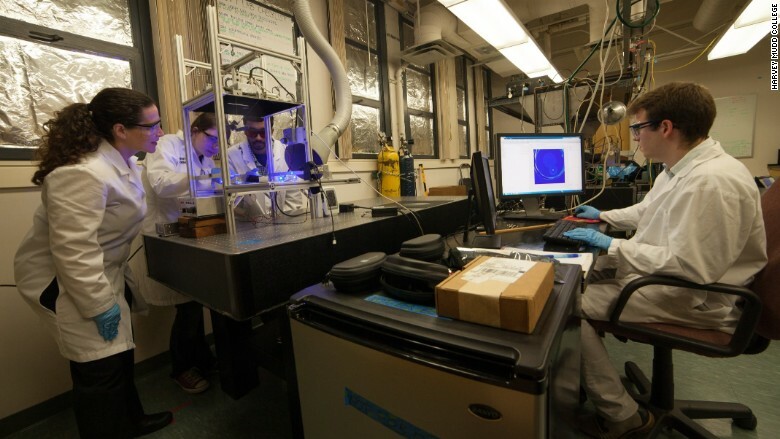 The school offers a mixed curriculum that you can't find at too many other STEM-focused colleges. One-third of students' courses are in the humanities and social sciences. The main reason why junior Kathleen Kohl chose Harvey Mudd over a big research institution like MIT was the flexibility to explore other interests outside of STEM. "I liked physics in high school, but I didn't really know if I wanted to continue with it. And I had other academic interests and didn't want to go to a school where I had to turn that part of myself off," Kohl said. She did, in fact, become a physics major. But she's also taken creative writing courses -- one focusing on Dickens and Hardy -- and is in the choir. Same goes for Tiffany Lim, a 2014 grad who now works as a software engineer for LinkedIn. "I was a robotics nerd, in the orchestra and read classics in my spare time. Harvey Mudd is really good at being the best of both worlds," Lim said. Mudders can take classes at nearby colleges like Claremont McKenna and Scripps, giving them a wide variety of options. Companies are lining up to work with Mudders before they finish their degrees. About 40 of them sponsor what's called the "clinic program" each year, and there's usually a waiting list, Klawe said. A team of students is assigned to each project. In the past, SpaceX has asked students to improve the software used on its rockets. A company called RevMedX had students help design an injectable bandage that can be used to stop heavy bleeding for the military. Another student team created a program to help People and Time magazines sort through the hundreds and thousands of photos submitted during events like the Oscars. "Monday through Thursday, people have their heads down and are studying hard. But on weekends, we have a very strong dorm culture -- it's kind of our version of Greek life," said Lim. 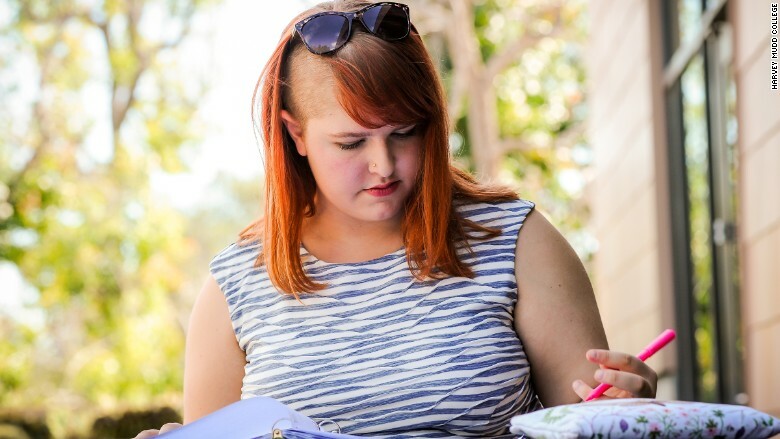 There aren't fraternities and sororities at Harvey Mudd, but each dorm throws two major parties every year that can "pretty involved," she said. Her dorm had five tons of snow delivered for a holiday party and flooded the courtyard for a pool party. Another dorm throws a "Wild West" party, covering the courtyard floor with peanut shells. And there was, of course, a mechanical bull. At a time when college costs and student debt is skyrocketing, you'd think the promising job prospects would be a big draw. But the thought of a six-figure salary isn't what brought Kohl to Harvey Mudd. "Sure, if I end up making a lot of money that would be a perk, but it's not a priority," said Kohl. She receives a scholarship from the school that covers most of the cost. But she'll still graduate with about $25,000 in loans. And although a lucrative career wasn't exactly what Kohl was gunning for, she knows that the STEM industries have solid job opportunities. Harvey Mudd junior Kathleen Kohl is a physics major. Nearly half of students there are female. Almost every Mudder was at the top of their class in high school. You have to love math and science, but not at the expense of other things. "One thing we look for in students is that they care enough to make sure others are understanding the material just as well as they are," said Thrya Briggs, vice president of admission and financial aid.